Low ceilings and reduced visibilities developed along the North Carolina piedmont during the morning of July 23rd. GOES-R IFR Probabilities showed the stripe of low ceilings/reduced visibilities extending northeast to southwest along the Piedmont. Observed IFR and near-IFR conditions roughly correlate with higher probabilities in the field displayed. Note that probabilities increase between 1100 and 1200 UTC, when the Sun rises and different predictors are used to compute the fields. In contrast, the brightness temperature difference field (below) does not have a strong signal, it would be difficult to use the fields to predict where fog/low stratus would be. GOES-R IFR Probabilities allow a better description of where fog/low stratus exists because of the use of Rapid Refresh data as a predictor of fog. In cases where the satellite signal is not strong, such as this one, saturation information from the model adds critical information. This entry was posted in Mid-Atlantic on July 23, 2014 by Scott Lindstrom. The Pacific Northwest is far from the sub-satellite point of GOES-West. Pixel size there is therefore greater than the nominal 4-km size at the sub-satellite point: Pixel size is more like 8 kilometers in the north-south by 5 kilometers in the east-west. 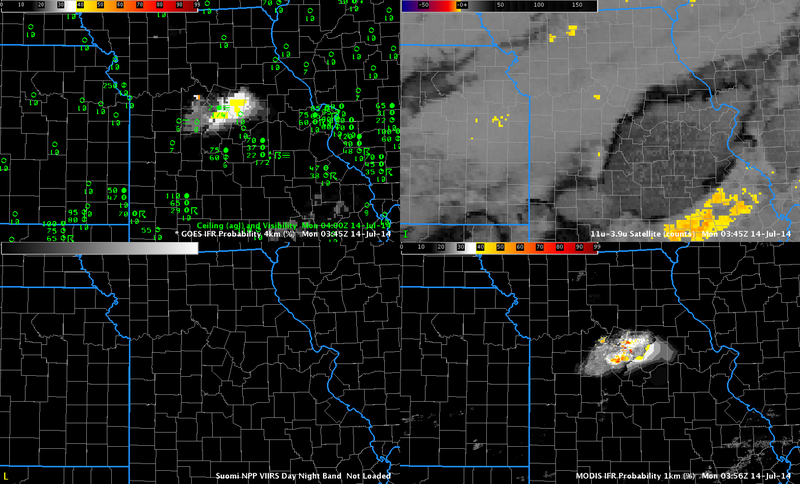 The animation above shows GOES- and MODIS-based IFR Probabilities and Brightness Temperature Difference Products. Both GOES and MODIS IFR Probabilities show an expansion (as observed) of reduced ceilings and visibilities as marine stratus penetrates inland over coastal Washington and Oregon. The visibility at Seattle drops as the high probabilities overspread the region. MODIS resolution is better able to depict the fingers of fog/stratus that penetrate up river valleys along the coast. GOES Temporal resolution, however, means that frequent updates are available. (Note the lack of MODIS data at 1300 UTC). 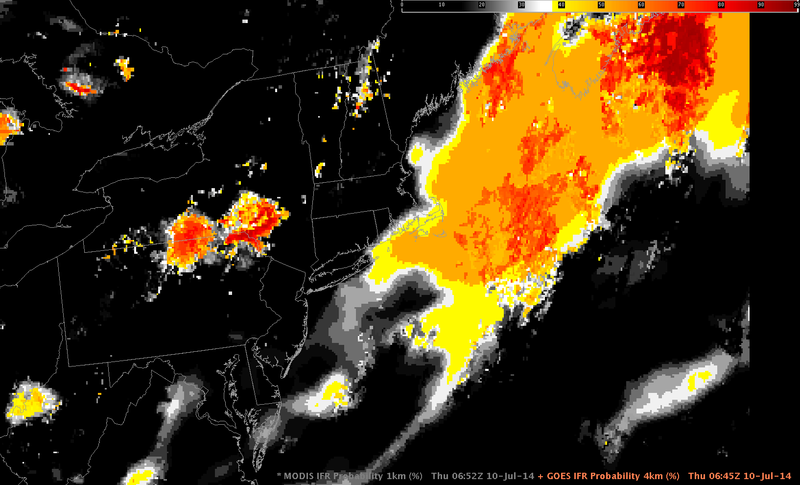 The brightness temperature difference fields from GOES and MODIS are different. The GOES field has a considerable false signal (as far as fog is concerned) related to changes in surface emissivity that occur in the arid intermountain west during summer. MODIS fields show less of this false signal because of differences in the spectral width of the channels. 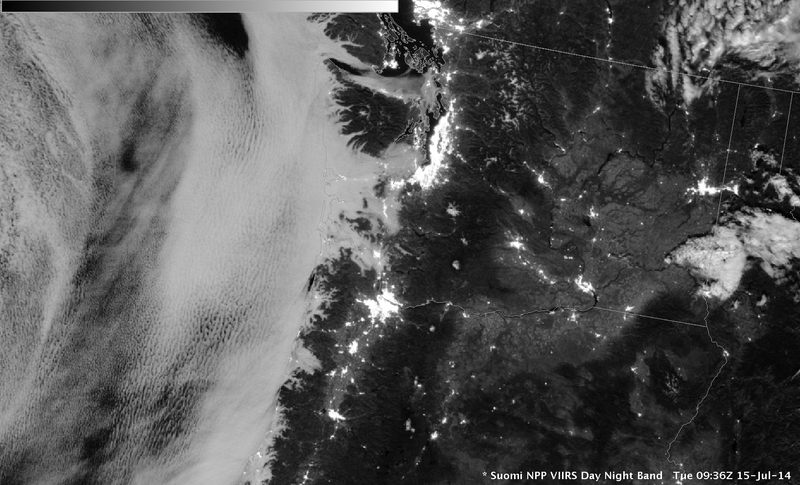 The Day/Night band on Suomi NPP, below, also shows the extent of stratus over coastal Oregon and Washington. This visible image uses reflected lunar light for illumination. This entry was posted in MODIS, Pacific Northwest on July 15, 2014 by Scott Lindstrom. The orbital geometry of Suomi NPP allowed two high-resolution images of Pennsyvlania early in the morning of the 10th of July 2014. Can you tell from the imagery above if there is fog/stratus in the river valleys of Pennsyvlania? Are the relatively cool clouds from Pittsburgh northeastward towards Elmira, NY obstructing visibilities? Based on the IR (11.35 µm for Suomi NPP) imagery alone, above, that is a difficult question to answer. Historically, the brightness temperature difference between the longwave IR (11.35 µm) and the shortwave IR (3.74 µm) has been used to indentify water-based clouds. Imagery from Suomi NPP, below, highlights where water-based clouds (like stratus) exist. If the clouds are the same temperature as the surrounding land (likely the case for river fog), a single 11.35-µm image is of little help in identifying the clouds. The Day-Night band can also highlight where clouds exist, because lunar illumination reflects well off clouds. A 3/4-full moon ably illuminates the scene at 0609 UTC, but that moon has set at 0747 UTC and the Clouds are harder to see. 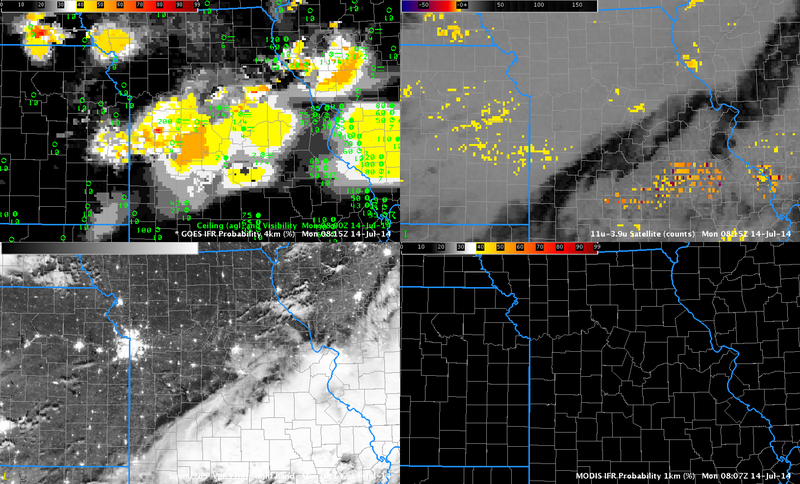 Both the Day/Night band and the Brightness Temperature Difference Fields (and any Infrared image) gives information about the top of the cloud. Fog existence is difficult to discern only from satellite data because the bottom of the cloud is not sampled. This is why a fused product (such as IFR Probability) that includes surface information (in the case of IFR Probability from the Rapid Refresh Model) is desirable. MODIS data can be used to compute IFR Probability, and a MODIS-carrying Aqua pass occurred in between the two Suomi NPP Passes shown above. In the two images above, note how the IFR Probability Fields de-emphasize the low cloud areas that stretch northeastward from Pittsburgh towards Elmira. This is likely mid-level stratus. River Fog over northeast Pennsylvania is highlighted in the IFR Probability fields (and in the brightness temperature difference field). This image, which shows the GOES-based IFR Probability field at 0645 UTC, highlights the power of MODIS’ superior spatial resolution in the early detection of small-scale fog. The large region of reduced visibility around Elmira NY (meager surface observations suggest this large region of fog verified) appears in both MODIS- and GOES-based IFR Probability fields. Only the MODIS-based IFR Probability field, however, has a distinct river-valley signal over northeast Pennsylvania. MODIS and GOES IFR Probability both suggest IFR conditions may be occurring over the Atlantic Ocean. The brightness temperature difference field shows no low cloud signal there because of a cirrus shield. IFR Probability gives a signal of fog here based on information from the Rapid Refresh. This entry was posted in Appalachia, Day/Night Band, Mid-Atlantic, Suomi/NPP on July 10, 2014 by Scott Lindstrom.